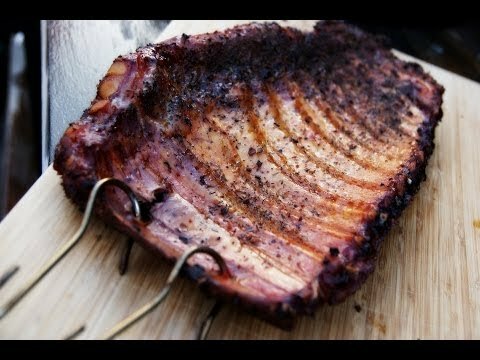 Another great recipe from our friend PitmasterX. The video for the rub is here. Set up your smoker to run at 225°F, without the grills inside and have your hanging hooks to hand. Rub the ribs with french mustard, followed by your cranberry rub, try to get an even coating all over. Take 2 hooks per rack and insert them about 2 ribs in from the end of the rack, and hang them inside the lid of the smoker, above the waterpan. Cook the ribs for 5 hours at 225°F, once done, remove them and allow them to rest for 10-15 minutes before carving and serving.